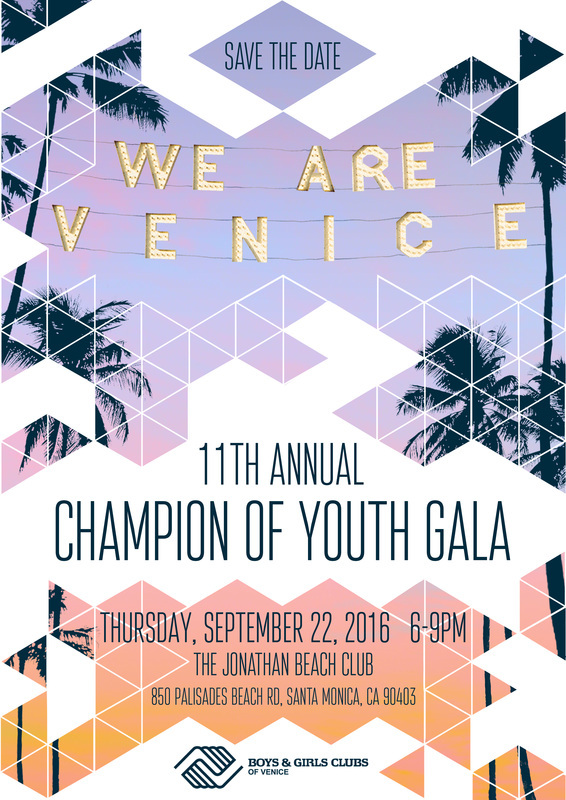 The 11th Annual Champion of the Youth Gala ​is just around the corner and we are hoping for a great turnout. Last year the event surpassed our goal, raising over $400,000 for our Club and local youth. This year we know that with your support, we can make an even bigger impact for the youth in the Venice community. SAVE THE DATE because this is one event you will not want to miss!! Where do you see yourself on September 22nd, 2016? I have an idea… how about the Jonathan Beach Club in Santa Monica with your toes in the sand during a beautiful Westside sunset, all in support of the Boys & Girls Clubs of Venice? We invite you to celebrate with us at our signature event! The event will include a hosted reception, dinner, special performances by Club members, entertainment, in addition to silent and live auctions. We will pay special tribute this year’s Champion of Youth. We would be honored to have you join us on this very special evening. If you need more information, please don’t hesitate to ask. If this day doesn’t work for you, we also have many ways in which you can support the 5,000 youth we serve. For further information or questions, please contact Emily Harvey at (310) 390-4477 or email Emily@bgcv.org. “To see all the photos from this year's Gala please hit the button below.